If you are ready to contribute to our efforts to reduce ship strikes to whales along the west coast, head to the coast on land or at sea - just download Whale mAPP for Android first! Whale mAPP is still in beta mode, so it is not yet available in the Google Play store. However, you can sign up to be a beta tester! Click here to sign up. Want to learn more about the key features of Whale mAPP? Find out more here. In partnership with California’s Marine Sanctuaries, Point Blue Conservation Science (Point Blue) is aiming to use science and innovative technology to protect endangered whales from being injured or killed by commercial vessel traffic in the increasingly busy shipping lanes off the west coast. Point Blue worked with Cordell Bank and the Gulf of the Farallones National Marine Sanctuaries to help designate new shipping lanes into the San Francisco Bay to reduce the risk of collisions between whales and ships within the Sanctuaries. These new shipping routes, along with new changes in the Santa Barbara Channel, recently went into effect. Although the shipping lane changes are a step in the right direction, more can be done to address this issue. Whales and their food are in constant motion, which makes it difficult to track their locations from day to day. New shipping lanes reduce the overlap between vessel traffic and the whale’s preferred habitat, but they still cross very important habitat for endangered whales south of the Farallon Islands and northeast of Cordell Bank. That is where Whale mAPP comes in. 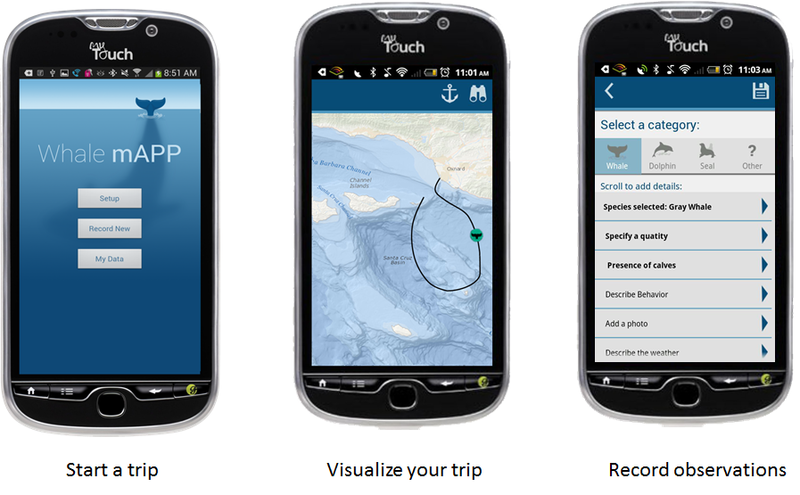 This new Android application was funded and supported by The University of Redlands: Center for Spatial Studies and MS GIS Program, The California Coastal Commission's Whale Tail Grant Program, and the Alaska Whale Foundation. The data will provide NOAA with information they need to request the US Coast Guard’s Vessel Traffic Service to ask ship operators to slow down or change course as they approach areas where whales have been sighted.